This book follows Jill Gardner, as she welcomes a new store owner into South Cove, Kathi Corbin a recent transplant from Texas has decided to make a run of a tea shop. When Kathi's sister Ivy shows up Kathi is rattled and Jill can't figure out why. To make matters worse someone is trying to run down the residents of South Cove and when a relative of Kathi and Ivy's winds up dead Jill finds herself wanting to find out what is going on in their small town. 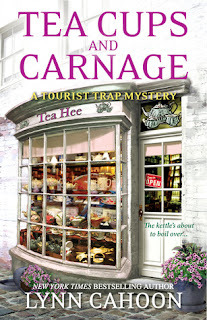 Lynn Cahoon has this great ability to write mystery that really pulls you in and won't let you go. You find yourself traveling along with Jill and the other residents in town trying to unravel the mystery and to what degree someone is trying to frame someone else. I found myself pulled in and was pleasantly surprised by this great adventure. I can't wait to see what is next for the South Cove residents!